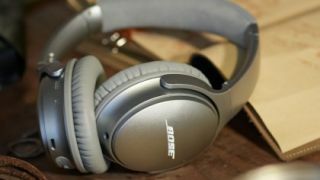 Bose's next pair of high-end wireless headphones look like they'll include a little something extra: support for Google Assistant. Several leaks, including an image in a Bose newsletter spotted last month by The Verge, have pointed to the existence of the QuietComfort 35 II, an upgrade to the current-gen QuietComfort 35. One of the mysteries surrounding the new headphones has been a never-before-seen button on the underside of the left cup. As evidenced in documentation seen by 9to5Google and images from a Reddit user, it now appears the button will launch Google Assistant. This would make the Bose QuietComfort 35 II among the first set of smart cans to rock Google's digital helper. "With your Google Assistant built in, you can control music, send & receive texts, and get answers using just your voice. Just press and hold the Action button, and start talking." A Reddit user also posted purported images of the retail packaging for the QuietComfort 35 II. You can see in the image above Bose isn't shying away from touting Google Assistant's arrival in its line. The Action button is also visible on the underside of the left ear cup in the image on the box. Aside from the new button and Google Assistant, not much else seems to differ between the QuietComfort 35 and the upgrade. Two QuietComfort 35 II color options - black and silver - will be available. Battery life is listed at 20 hours, same as the current model, and the same noise-cancelling tech looks to apply. As for price, all signs point to the QuietComfort 35 II costing the same as its predecessor. At $349.95 (£289.95 / AU$499), the headphones aren't cheap, but they do feature industry-leading noise cancellation.